I don't remember this picture or (scene)? but it has been posted more than a month ago. Sorry if repost. @dukesa1122, @NongpeeP or could be a deleted scene? No. I dont believe I saw that scene at all. The only scene with a bike i can recall was when they were starting the some relationship. Wonder what that is. Oh my god i totally thought today is Wednesday and was perplexed why there’s no one is live recapping. finally watched ep 14 today and true to kdrama to a fault, that episode defines calm before storm. Maybe I will not be around until I catches the penultimate and last episode back to back so enjoy the last moments people! Thanks for everything and happy days ahead!! @bohmi hmmm that is odd. She’s not in her heels too but she’s holding what looks like the script on her hand. Yes, it's her same mom in DOTS. She was also Oh Yeon Joo's mom in W and she was one of the (many) moms in Mother. I think she was a mom in Just Between Lovers, too, if I remember right. She has a nice range of talent. I felt so much empathy for her in Mother. But man, I hate her character in this one!! This continues to be a really lovely drama. The animations at the beginning and end, the acknowledgement of real life difficulties when you want to make a relationship work, the clear statement against unhealthy, controlling relationships, and the way the main couple just keep quietly working against all their challenges--all really excellent. When his mom came to talk to her and tell her to break up, SHK's acting was just perfect, too. My heart just broke for her. I haven't followed her career extensively until now, just seen her in a few things, but she's nailing that role of a girl who has to be stiff and stoic on the outside, but feels a lot on the inside that she can't show. 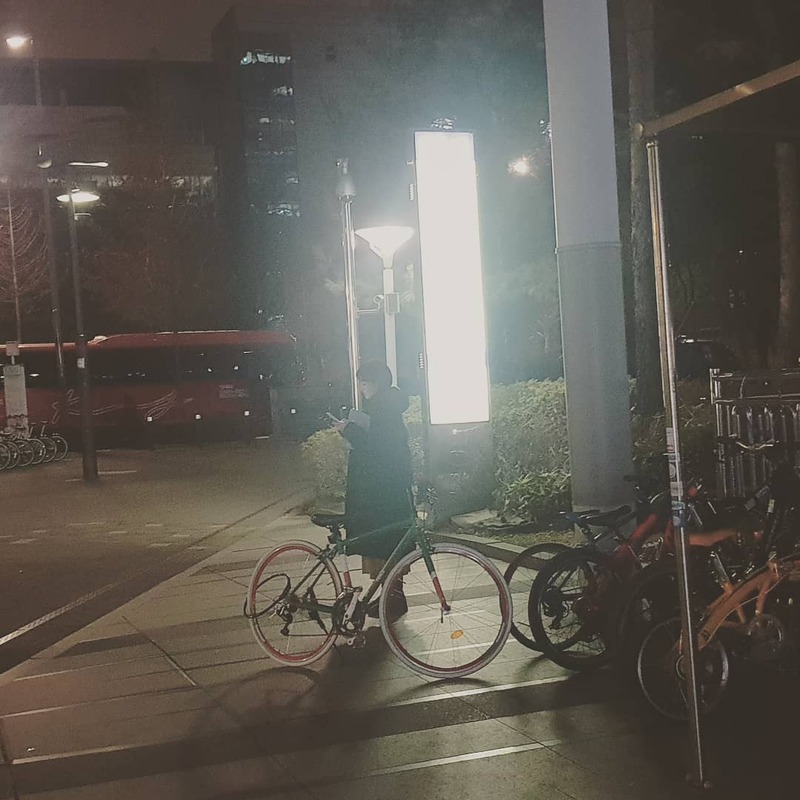 i think it may have been the bicycle ride scene..coz it looks like there is an expressway behind her..so she might be reading the script!! How lucky can that passer by be? When you are at the right place at the right time. It doesnt look like an expressway. It looks like a bus terminal. If you look closely, there are buses in the background. Colleagues or co-workers in a drama who have just met for working are different from closed friends for years, that’s why I am surprised when they called Park Bo Gum as Bogummy including the actor who acted as KJH’s younger brother as P.O. Other lead actors/actresses are unlikely called with suffix “aa or ee” by colleagues. KJH and HI are closed friend from teenagers in neighbor for years, HI can call Jinhyuka naturally. For “shi”, I might be slightly annoyed when KJH and CSH called each other with “shi”, it does not only express respect but it also shows distantly. I am wondering the real boyfriend/girlfriend who started their relationship in office, would they call each other with “shi” when they are privately together as KJH and CSH or not? Oh, has this SHK’s scene been on air yet? Could I hope for sth positive? Wow, your notice suits the new emoji of insightful indeed. Shucks I’m dreading to watch tomorrow’s episode. But I can’t wait. I love CSH’s style on her second time in Cuba, where she’s wearing white top. Her no-make-up-look makes her glow even more. Her natural beauty is really something else. Especially when they were kissing and she opened her eyes, what a beauty. Her look on those scenes is so refreshing. So light that you will not think that she’s a CEO. In those times, she’s not carrying the loads of stress in Korea, she is merely KJH’s girlfriend. I really want them to call each other "Soohyun-ah" and "Jinhyuk-ah"
On the scene where she’s drunk and force-feeding him the carrot. I heard something like: “uri jinhyuk shi ahhhhh (feeding him the carrot) “uri soohyun shi...” something like that.. is that a term of endearment? I like the last sentence, same as you. It is the fact of their love life. KJH’s mom would not be the last obstacle in KJH&CSH’s love life. In addition, LollyPip’s comment made me understand CSH more thoroughly. At the very beginning, when I watched Encounter ep.14, I accepted that I did not get why CSH has been severely impacted from KJH’s mom because I thought KJH&CSH have already been in deep love after facing obstacles including public bully already, things can not reverse. After I understood CSH and I rewatch ep.14 with heavy feeling to CSH for her depression and self underestimation. , without knowing what happened to CSH to be such grieved. How will his heart be broken down in tears when he knew that his beloved mom hurt his beloved girlfriend and KJH himself most severely ever in his love life. His heart might be critically trampled from strong break up signal by CSH and CSH who will have to do such break up in explicit action to hurt KJH and herself. Let me bring content to share in this forum. After Jin-hyuk’s mother begs her to break up with her son, Soo-hyun goes home feeling despondent. She can’t stop thinking about how his mother said that she wants to have her family live a normal, happy life, and that she’s scared Jin-hyuk will get his heart broken. At work the next day, Secretary Jang brings Soo-hyun the preserved bouquet that Jin-hyuk gave her. She wonders sadly how long the flowers will last, and Secretary Jang says they’re supposed to last at least five years. Soo-hyun’s father invites Jin-hyuk to dinner, and he asks how things are going with Soo-hyun after their rough patch. Jin-hyuk says that he cherishes Soo-hyun very much, and that she taught him how it feels to love, so he wants to take responsibility for that love. He’s stating his intent to marry her, and her dad says that his biggest worry has always been that Soo-hyun would end up alone. Because of that, he’s always been to scared to do something he’s always wanted to do, but he says he’s going to do it now that Jin-hyuk is by her side. Secretary Jang goes to see Dae-chan, to ask him about the note Jin-hyuk’s mom wrote to Soo-hyun. He says he didn’t read it, and Secretary Jang grumbles that Soo-hyun is acting strange. Jin-myung joins them, and he volunteers Secretary Jang to work a shift for him while he goes to a reunion, sweet-talking her into it by calling her the Goddess of Waiting Tables. LOL, she’s so easy. Soo-hyun’s father visits the columbarium where his old friend Jung-pyo’s ashes are stored. He apologizes for not coming ever since he got into politics, and says that he’ll come back again after he gets everything sorted out. On his way out, he runs into Driver Nam and DK, so they go to lunch together. DK asks why he stopped visiting Jung-pyo with them years ago, addressing him as “Congressman,” but he mutters that they won’t be able to call him that much longer. He says he only came to report to Jung-pyo, but he doesn’t elaborate on his cryptic statements. Soo-hyun asks Secretary Jang to drink with her, surprising Secretary Jang when she takes her to a pojangmacha instead of a fancy wine bar. After a few shots, Secretary Jang asks what’s up, and Soo-hyun just says, “Nothing yet.” Secretary Jang guesses that Jin-hyuk’s mother must have told her to break up with Jin-hyuk, and although Soo-hyun says that’s not it, she looks like she’s on the verge of tears. She admits that she’s not sure if she should keep seeing Jin-hyuk, and Secretary Jang says that she approves of them now, so why would Soo-hyun think this way? Soo-hyun says she thinks she doesn’t fit with his family, but Secretary Jang snaps that what matters is that they fit. Soo-hyun says sadly that everything is new for Jin-hyuk, while she’s been married and lives in the spotlight, and there’s a limit to how much they can dream together. Secretary Jang reminds her that Jin-hyuk doesn’t care about those things, but Soo-hyun admits that she’s bothered by them. Watching Soo-hyun struggle not to cry, Secretary Jang sighs and says that it’s Soo-hyun’s first love, too. They both burst into tears, and Soo-hyun sobs that she doesn’t want to break up, so Secretary Jang tells her not to, but Soo-hyun says that her heart keeps sinking. Secretary Jang tells her to talk to Jin-hyuk about this, but Soo-hyun argues that he’ll only tell her not to worry and then suffer alone. She feels like she’s the one who has to decide if they move forward or not. Secretary Jang says that Jin-hyuk is a better person than her, because he will hug her, carry her, and be with her until the end. Jin-hyuk gets the idea to make a camera case, so he visits a studio that teaches leatherworking. He learns how to work the leather, which is painstaking, but rewarding. He calls Soo-hyun in the morning, disappointed that she hasn’t called him since they both have the day off. Soo-hyun tells him she’s going to the countryside on personal business, and he invites himself along to help. They end up at an art gallery, and Jin-hyuk notices that Soo-hyun seems sad as she looks at the paintings. He invites her to walk outside with him, and as they go, they’re spotted by Woo-seok’s former girlfriend, Soo-ah. Jin-hyuk says he’s been thinking of something to do with his vacation days, and suggests they go on a trip together in the summer. Soo-hyun doesn’t answer, so he tells her to think about it. On the drive back to the city, Mrs. Lee calls Jin-hyuk and asks him to have Soo-hyun visit her alone. He jokes that she probably wants to tell Soo-hyun a bunch of bad stories about him, but he’s noticed that Soo-hyun is preoccupied, so he casually adds that Mrs. Lee is a great listener. That evening, Jin-hyuk and his mother go to dinner together, just the two of them. Jin-hyuk asks how she felt about having Soo-hyun to the house, and when Mom says that she just tried to take care of their guest, Jin-hyuk chides that Soo-hyun is more than a guest. Mom asks if it won’t be hard for them, being from such different worlds. Jin-hyuk says that he never thought he’d like someone this much, but Soo-hyun is more than just someone passing through his life. He says he’d like for Mom to like her, too, because she’s a good person who makes him a better person. Mom says that he’s young, and she wants him to consider all of his options and not just settle on one path. But Jin-hyuk says he loves only two women in this world, her and Soo-hyun, though in different ways. Mom says that her love won’t change because she’s his mother, but Jin-hyuk insists that Soo-hyun’s love won’t change, either, that it’s too late for that. Soo-hyun ends up visiting Mrs. Lee, who asks if Soo-hyun feels closer to Jin-hyuk after meeting his family. Soo-hyun says she does, but Mrs. Lee can tell something is wrong, so Soo-hyun asks if she can vent her worries. Mrs. Lee promises no to repeat anything she hears today, not even to Jin-hyuk. Soo-hyun says that she laughs more since she met Jin-hyuk, because she’s never been so happy. But she reveals that Jin-hyuk’s mother came to see her, and that she’d expected it. She says that ever since Jin-hyuk suggested they be in a “some” relationship, she’s been worried whether his parents would like her. Crying now, she sobs that it would be wrong of her to disrupt the happiness of Jin-hyuk’s family. She asks if she should go to them and beg understanding, but she already knows how exhausting it is to live in the public eye. She says that she knows she must end things, and Mrs. Lee sits looking sorrowful long after she’s gone. A news article goes out, announcing that Soo-hyun’s father has merged parties and dropped out of the presidential race. Woo-seok in particular looks sick about it, knowing that his mother will use this as more evidence that Soo-hyun should be removed as CEO of Donghwa Hotel. And he’s not wrong — when she sees the article, she fumes that she’ll get revenge on Soo-hyun’s father for dropping her before she could drop him. But nobody is angrier than Soo-hyun’s mother, who confronts her husband for making this decision without telling her. Her main concern is the loss of her dream of being First Lady, and Soo-hyun’s father looks embarrassed at her selfish rant. He tells her that he’s grateful for everything she’s done, but he wants to start a new dream. He says he needs her help with something else, because this is just the beginning. Soo-hyun asks her dad why he’s doing this after he’s worked so hard. He also tells her that this is just the beginning, and that he feels there are more important things he should be doing while he has the power to do them. He says he feels like a huge weight is off his shoulders, and he thanks her for setting a courageous example. Afterward, he goes for a drink with Driver Nam, so Driver Nam asks Jin-hyuk to drive Soo-hyun home. Jin-hyuk asks Soo-hyun if she was startled by her dad’s news, but she says she was mostly startled by his bravery. Jin-hyuk says that in times like this, you should become even happier than usual, and that she has her father, her employees, and him all loving and protecting her. Secretary Jang calls Soo-hyun from Dae-chan’s restaurant to tell her something, which makes Jin-hyuk want to go there for dinner. Soo-hyun isn’t in the mood, so Jin-hyuk tells her to choose — spending time with him, or going to eat moon snails. Secretary Jang is working because Jin-myung is at a reunion. He spends the evening fending off questions about Jin-hyuk and how his family must be rich now that he’s dating Soo-hyun. One guy keeps making suggestive comments about Jin-hyuk seducing a rich CEO, until Jin-myung loses his temper and punches him, sparking a fight. He calls Dae-chan, who runs out to pick him up at the police station. While he’s gone, Jin-hyuk and Soo-hyun arrive at the restaurant, so Secretary Jang nervously explains what happened. Jin-hyuk also goes to the station and finds Jin-myung looking unhappy and ashamed, and he gently takes his little brother’s hand. From outside, Soo-hyun sees them together, both downcast. She can’t help but think of what their mother said about her fear of gossip and what it might do to Jin-hyuk and her family. She walks back to her car and cries, her own fears of disrupting Jin-hyuk’s life swirling in her mind with memories Jin-hyuk saying that he wants to live with her for the rest of his life. Jin-hyuk and Jin-myung go to their playground, where Jin-hyuk praises his brother for defending his family. Jin-myung says grumpily that he didn’t do it for Jin-hyuk, it’s just that that guy has teased him since middle school. Jin-hyuk suggests they keep this from Mom and Dad, and he apologizes, then offers to kiss Jin-myung’s booboos, hee. Back at home, Jin-hyuk calls Soo-hyun and tells her what happened, leaving out the reason Jin-myung got in the fight (he doesn’t know that she already heard it from Secretary Jang). She knows he’s not telling the truth, but she doesn’t say anything. At work, Secretary Jang tells Soo-hyun that Soo-ah, Woo-seok’s ex-girlfriend, wants to meet with her. Soo-hyun agrees, and Soo-ah gives her the painting that Soo-hyun liked at the gallery, which happens to be Soo-ah’s artwork. She says she’s moving to New York, so the painting is an apology. She explains that her relationship with Woo-seok was entirely fake, and that for the occasional dinner or play, she was paid enough to be able to go to college and open up an art academy. She confesses that after a while she developed feelings for Woo-seok, but that he never for an instant returned those feelings. Soo-hyun thinks about this for a while, then goes to Woo-seok to say that she knows everything. She asks why he did it, and he says it was to give her space. Soo-hyun says it must have been tough, but he replies that it was nothing compared to what she went though in his home. She says she’s grateful, but that what he did broke her heart. She tells him that she was ridiculed and gossiped about, and that you should consider the other’s feelings when you break up. Looking ashamed, Woo-seok says that he thought he could make her happy when he brought her into Taekyung Group, then he thought it would make her happy to send her away. Soo-hyun acknowledges that it must have been hard for him too, with nobody to talk to. But she tells him to let it all go and stop worrying about her, and she says that he taught her how to part ways. Jin-hyuk finishes the camera case he’s been making, then calls Soo-hyun to invite her to go to a bookstore with him tomorrow. He’s surprised when she accepts, since that’s one of his date ideas that she didn’t seem keen on, and she adds that she also wants to go to a famous restaurant and stand in line to wait for a table. The next day, they stop at a coffee shop and decide to take more pictures of themselves, since Soo-hyun feels like she looked stiff in the other ones. They head to the bookstore and spend time just browsing lazily, enjoying the low-key time together. Who is this girlfriend from the poem? Someone kind. How did you two meet? You must have loved her dearly. That’s right. I did. I even wanted to take her to the ends of the world. Jin-hyuk goes to the counter to buy the book, and Soo-hyun stands watching him from a short distance away. He looks up and gives her a happy smile, and she smiles back. But her smile breaks, and tears fill her eyes. Jin-hyuk: “Soo-hyun-sshi, I wonder where your world ends. Wherever it is, though, I’m certain that I’ll be there with you. I really had hoped that we could get through this entire drama without something like this happening, because Soo-hyun and Jin-hyuk’s determination to stay together no matter what happens has always been my favorite part of the show. I’m disappointed that Soo-hyun caved to Jin-hyuk’s mother’s pressure, and I just want to (metaphorically) smack his mom for making Soo-hyun feel like she’s not good enough for their family. I know Soo-hyun loves Jin-hyuk, and I know she’s scared because she’s been hurt before, but I’d just thought she had more faith in his love than to do this. I hope that Jin-hyuk fights back, and refuses to allow this — he usually knows what Soo-hyun is feeling even before she does, so I have faith in him to see through her and realize that this isn’t what she really wants. Not that I don’t understand her fear, and her reasoning for this decision. Soo-hyun has never had a warm, loving family, and I think that she was deeply affected by that simple dinner at Jin-hyuk’s house, and how happy and close his family are. She thought, for a moment, that she’d been accepted by this wonderful family, then she got slapped in the face by his mother’s disapproval of their relationship. And Jin-hyuk’s mom hit a really big nerve when she said she’s scared that being involved with Soo-hyun might disrupt the simple peace her family has, because she’s not wrong — it already has, in some ways. So Soo-hyun, who has longed for a family like his and who, for just a moment, got to dream of joining them, was suddenly painted as the outsider who could ruin it all, and joining Jin-hyuk’s family went from being her fondest dream to her biggest fear. In her mind, she’s doing for Jin-hyuk what Woo-seok did for her — letting him go so that he can be happy. I guess that I just wish Jin-hyuk’s mother hadn’t gone straight to “you’re going to destroy everything,” but instead had approached Soo-hyun with an attitude of, “My son loves you and you’re a wonderful person, let’s talk about ways that we can support you two without upsetting the bonds of our family.” Just because Mom fears that her family might be negatively affected by Soo-hyun’s fame and status, doesn’t mean that the family crumbing is the only possible result — they could become stronger, like Jin-hyuk and Soo-hyun have as a couple. It especially bothers me that Mom came to Soo-hyun as if she were speaking on behalf of the whole family, yet the other three members — Dad, Jin-hyuk, and Jin-myung — all love Soo-hyun and support their relationship. But Mom had a fear, and instead of discussing it with her family first and letting them help her find a more loving, understanding way around the problem, she just went straight to the “nuke it from orbit” solution all on her own. She completely undermined Soo-hyun’s confidence in herself and ignored her own son’s strength to withstand anything that might come at them. Mom made Soo-hyun feel as if her very presence in Jin-hyuk’s life would destroy his family, when Jin-hyuk’s whole argument to Soo-hyun regarding their relationship is that they don’t have to let outside influences change them. The problem, as I’ve seen it from almost the beginning, is Soo-hyun’s lack of confidence. She wasn’t raised with love and when she married, there was no love shown to her. She was only valuable for what she represented, like status and connections — she was never treated as though she, herself, was a valuable gift. But her status and connections aren’t things that would benefit Jin-hyuk or his family, so from the moment she fell in love with Jin-hyuk, she’s been afraid that she has nothing valuable to offer him. Jin-hyuk can tell her every day for the rest of his life that her love is enough and that he doesn’t care what others think, but Soo-hyun grew up in a world where the opinions of others are more important than anything else, and she knows how painful gossip can be. She doesn’t have the confidence that Jin-hyuk has to disregard all that and let the chips fall where they may. She’s terrified that her love will harm Jin-hyuk in some way, so she would rather let him go than hurt him (and his family) just by loving him. This isn’t noble idiocy — it’s fear, plain and simple. Until Soo-hyun learns to get over her fear and trust Jin-hyuk when he says that she’s worth it, just herself and nothing else, this relationship will never work. Yes, to pair with Song Hye Kyo who has beautiful skin and goddess of actresses, Park Bo Gum has interviewed thar he has worked out hard to be muscle fit. His body and face has been improved to be more manly with obvious muscles esp. chest and shoulder compatible to business suits, much better compared to PBG in previous acting projects. I like the result of PBG’s and SHK’s severe pressure from their pairing confirmation to make them working much harder, not just the body&face working out but I felt their sense of survival in their acting too. SHK with slim fit body and v-shape face looked much younger and I feel no age gap in Encounter at all, just social gap as in the story. I salute PD and the production house who have sharp eyes to insist pairing PBG and SHK even they faced controversial from the age gap. After I have watched and rewatched countlessly, I appreciated them the most for their acting to be exactly the characters and their professional determination to create their chemistry even nobody ever believed they can. When I watched BTS, their real identities amaze me even much more because of the difference from their assigned characters ...easily smiling SHK, playful PBG and PBG’s respectful interaction to SHK. I want them to start speaking in informal way/banmal. Jinhyuk did once when he was saying goodbye to Soohyun after she dropped him off at the bus station after the new years eve. It was fluttering!! Agree. Especially on the scene when KJH was the one taking the photos from the hotel's wedding cover, I can clearly see his chest muscles It's funny how when I'm looking at the BTS scenes and PBG is acting like PBG. He's a cute little bunny that I just want to hug. Last episode? When CSH was staring at "The Wedding" painting and KJH sneak up to her and whispered "Soo Hyun-shi". I like the different height between PBG and SHK too, KJH looks protective to CSH when KJk embraces CSH’s shoulder while walking together. CSH looks petite when she hugs or kisses with much taller KJH. My favorite CSH’s body was when KJH embraced her delicate waist in CSH’s house when she poured tea. I saw scenes with Chest and shoulder muscle, this is the real inspiration to make people work out to improve body appearance. By the way, KJH and CSH still called another with suffix of “shi”. I want them drop this suffix in many scenes after they are boyfriend/girlfriend. Counting down 15 hours to ep.15 with Eng subtitled preview.